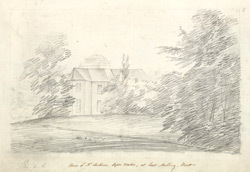 Drawing of Clare Hall, the mansion house at East Malling in Kent. It was built in 1793 in the neo-classical style for John Larking who was a banker, timber merchant and owner of a paper mill. He was one of the first paper makers to use chlorine in the to bleach the paper and remove its yellow tone, since chlorine had been discovered in 1790. The house was designed by Michael Searles who gave it a cruciform plan and stuccoed walls. This view shows the end of one of the side cruciform wings. The roof is covered by low pitched overhanging slate and has a low glazed dome, resting on a drum shaped base.